As one of the four living members from the 1951 National League champion New York Giants, former relief pitcher George Spencer can speak with candor about his playing career and the current state of baseball. “My playing days are long gone, but the memories are still there. It’s a great game, it seems like it’s a shame it has gotten to where it has,” he said in during a January 2012 phone interview from his home in Ohio. Well before the advent of players celebrating on the field for every diving catch, stolen base, or home run, Spencer was a two-sport star at Ohio State University, where he also played quarterback for their football team. More than sixty years later, Spencer has no regrets selecting baseball over football. “I played football and baseball. I had two quarters, one for football and one for baseball and neither one of them took!” Spencer laughed. “I picked the right sport anyway. I can still walk and get around fairly decent." Spencer signed with the Giants in 1948, and after three seasons in the minors, the Giants summoned him to the majors in August 1950, albeit much to his surprise. The following exchange ensued between Spencer and his manager. Spencer joined the Giants in Philadelphia and quickly found out that things were a bit more intense on major league soil. A few days later at the Polo Grounds, Spencer toed the rubber for his debut against their cross-town rivals, the Brooklyn Dodgers. After getting through a scoreless first inning, Spencer received another major league lesson. After posting a 2.49 ERA in ten games his rookie season, Spencer returned for a full year with the club in 1951. During that year, Spencer had a front row seat to some of baseball’s most legendary spectacles, which included pitching in the World Series, watching Bobby Thomson flatten the hopes of Brooklyn faithful, and last but not least, the debut of a young kid from Alabama named Willie Mays. 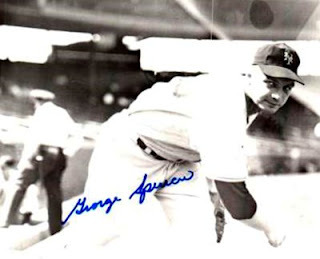 During the infamous playoff game where Thomson hit “The Shot Heard ‘Round the World,” Spencer recalled the performance of Don Newcombe dashing his World Series hopes. The bullpen let out a sigh of relief when Charlie Dressen went to the mound. Thomson’s home run propelled the Giants to the World Series against the New York Yankees who featured the soon-to-be-retired Joe DiMaggio. In the seventh inning of Game Two of the World Series, Spencer pitched in relief of Larry Jansen. Standing across from him as he walked to the mound in his World Series debut was the famed Yankee Clipper. “The first guy I had to face was number five. I think I got about two-thirds of the way to the mound from the bullpen and I looked at the scoreboard and it said number five up there and I immediately thought, ‘What in the hell am I doing here pitching to this guy?’” Spencer wondered. Even though Spencer gave up seven runs in his two World Series appearances, he had a clean slate against DiMaggio the two times they squared off. Spencer remained with the Giants through the 1955 season, shuttling between the major league club and AAA. He pitched in six games for the 1954 World Series champs, contributing a 1-0 record during the regular season, but was not on the roster for the postseason. He resurfaced in the majors with the Detroit Tigers for cups of coffee in 1958 and 1960, playing full-time in the minors through 1963 before retiring. He became a pitching coach in the Detroit Tigers and Cincinnati Reds organizations for four years, taking the mound one last time as a player-coach in 1966 while coaching in Statesville, N.C.
Moving on from professional baseball, Spencer worked in a sheet metal factory for twenty years. Throughout all of his travels during his 17 years in baseball, nothing matched the rivalry between the two New York National League teams during that 1951 season.